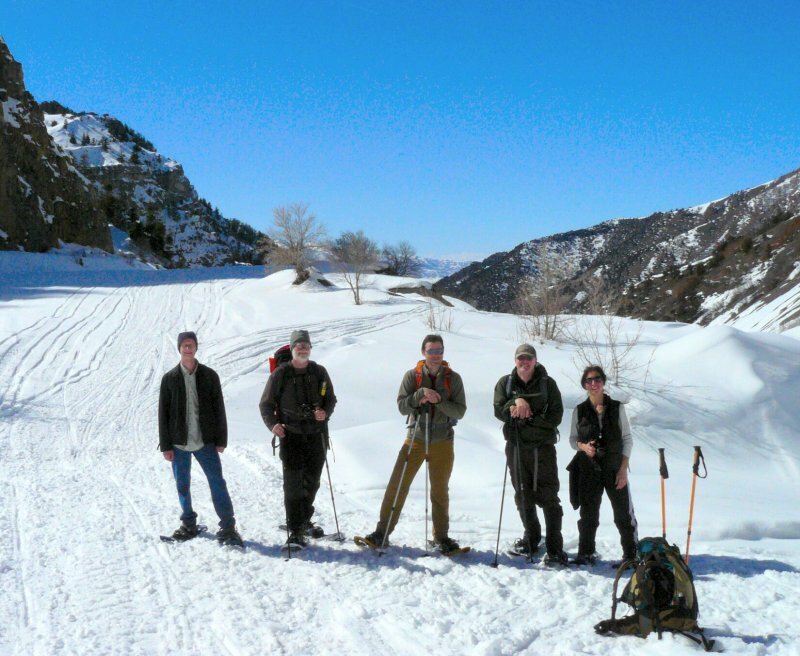 Thirteen adult and two child hikers enjoyed a snowshoe only trip up Providence Canyon. We carpooled to the mouth of the canyon and started our trip from the trailhead at 10:45am. At 12:05 we stopped for lunch, 2 1/4 miles from the trailhead. We spent about 40 minutes or so eating lunch, seated on the rails of a nice fence. After lunch, we split into two groups. Nine hikers proceeded back to the vehicles, arriving about 2:00pm. We were back at the Smith's Marketplace parking lot before 2:30pm. 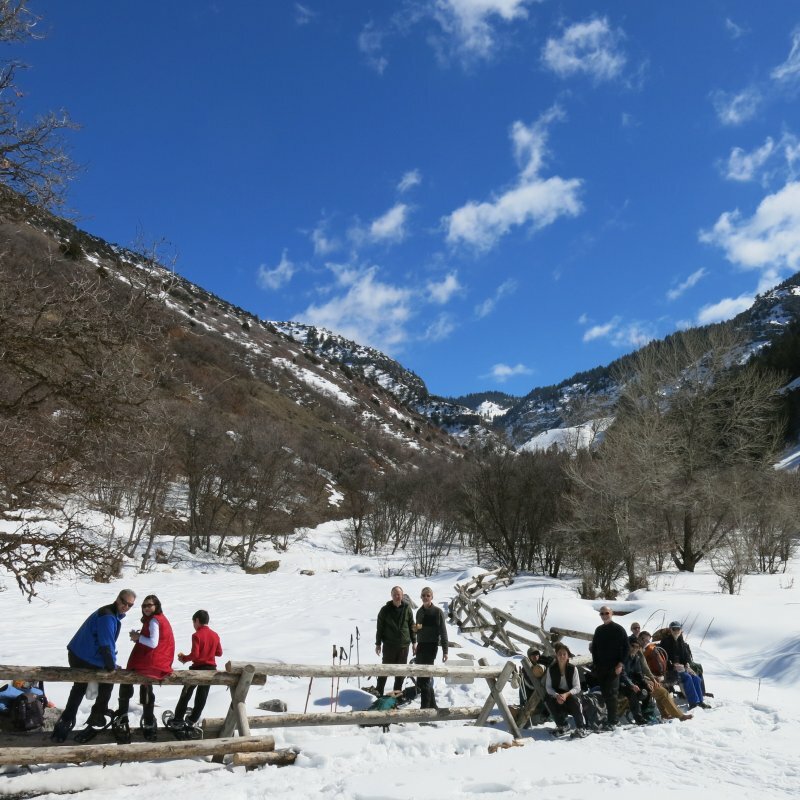 The other six hikers continued up the canyon to explore that newly-completed trail segment, arriving at the quarry about 2:10 and back at the trailhead at 3:30. The day was clear with beautiful blue skies, clean valley air, and temperatures in the mid to upper 30s. Spring snow conditions prevailed. Moderate snowmobile activity was observed and some target shooting was heard. The larger group, consisting of Susan (the leader), Dave P., Jane, Jeanne, Meghan, Michael, Stephane, Tim and Gordon, traveled 4.5 total miles with 800 feet of elevation. The smaller group of Dave W., Christine, Dan, Jim, Ryan and Alex, traveled 6.7 miles with 1500 feet of elevation. 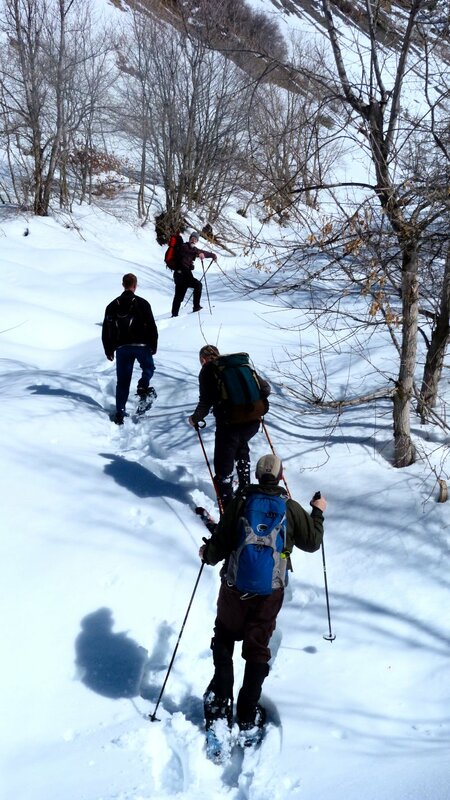 Dave W. thinks this was a long trip for snowshoes - the next time, he plans to use skis, going up on the trail and down on the road. Thanks to Susan for the narrative, and Christine and Dan for photos.